This love is equally evident in the foreword from Tania Hershman, who says of her own visits to Bristol’s Central Library “when I walk in through the doors I breathe out. This is where I am home.”Each of the pieces that follows holds its own quiet power, with some leaving echoes that had me mulling them over in the days after I’d read them. Sally Hare’s thoughtfully named ‘Those Who Would Otherwise Cold’ dropped me deep into protagonist Andrew’s world with an authenticity that left me feeling I would recognise him if we passed on the street, and its ending made me want to cheer for him, and undoubtedly be hushed by a stern librarian. In Shirley Wright’s “How Old Dreams Are Read’ we’re transported to an apparent fantasy land so poetically painted that each scene glows, none more so that the unexpected, vivid final one. Other tales use fantasy to highlight stark realities, as in Jenni O’Connor’s ‘Living Memory’, which examines Bristol’s slave trade at a very human level. In this story, as in both of Ali Bacon’s stories in the anthology, the power lies in what lies behind the words, in the human relationships past and present, with just enough shown to entice the reader into wanting to discover more. Scattered between the pieces sit snippets of history about Bristol Central Library itself and glimmering haiku gems that work together on our intellect and emotions, reminding us of our own love of books, libraries and all that they contain. 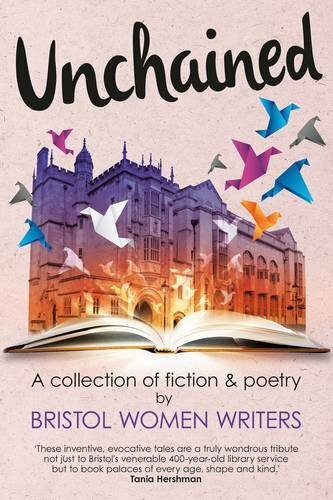 Unchained: A Collection of Fiction & Poetry by Bristol Women Writers by Bristol Women Writers is published by Tangent Books and is available to buy from Amazon. This entry was posted in Reviews and tagged anthologies, Book reviews, haiku, libraries, poetry, short stories by Judy. Bookmark the permalink.